How to Fix Your Muddy Driveway Fast! With all the snow that winter brings, there is sure to be muddy lawns and driveways once the snow melts and the rain starts. It's no fun to slip and slide walking from your car to the house because your driveway tries to eat your shoes. You might even get stuck trying to drive to work, since mud eliminates the traction for your tires. 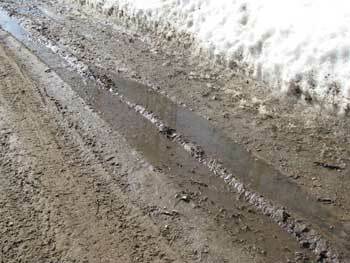 Stop struggling in the mud and muck, and try one of these easy solutions to keep your driveway from water-logging and turning into a mud pit. One of the issues with flooded, muddy driveways is there's no place for the water to run off and escape! So of course all the water will sit in your driveway and create a muddy mess. The simplest way to solve this problem is by creating a path for the water to follow and pool into a ditch or another low area that isn't your driveway. You'll need a shovel, or you can rent a commercial ditch digger. Imagine when it rains, where the path of the water is on your driveway. You'll want to try and follow that path, and encourage the water to keep flowing off the drive. So if the water runs from one one side of the driveway and pools to the edge, work on shimming down that side so the water doesn't stop there. If you use a shovel, try not to dig straight down. Instead, gradually scrape the topsoil so with the shovel so you are reducing the buildup layer by layer. Adding gravel to your driveway may present a cost, although it might not be necessary to gravel the whole thing. If you have several low spots in your driveway, it would be very beneficial to at least fill those areas. This will help in preventing the water from filling in the low spot next time it rains. By filling low spots with gravel, it will even out the area, and the gravel allows the rain water to run off, instead of getting trapped. Adding gravel will also provide more traction when driving over it. Once you address all the low spots and any holes in your driveway, creating a crown is a great way for efficient water drainage. This means that the middle of the driveway is the highest spot. 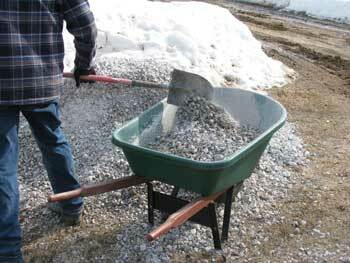 You can build up the middle by adding several inches of gravel to the center of the driveway. By creating a crown, you will encourage water to run off the sides and into the ditch. After adding all the gravel necessary, it's important to compact the gravel. This way, when you drive over that area, it wont cause shifting of the stones or create more low spots. You can compact the gravel with a plate compactor, tamping bar, or heavy duty roller. For a list of gravel providers, see our West Michigan Sand & Gravel page.